text copyright by Harriet Ziefert Inc. The Plot: Isn't it obvious? Road Trip to NYC. The Good: The story is clear and straight forward; the reading levels are defined: Level 2, Grade 1, ages 6 to 7, up to 100 words. As new words are introduced on a page, they also appear on the top of the page, highlighting the word and also allowing a beginning reader to match the two words. I like the NYC setting and the illustrations that capture details of the city. Oh and the lions? Not the lions at the zoo; the lions at the New York Public Library. Easy readers are hard for me to critique. I don't read a lot of them; and the ones I tend to like are the higher levels. While story is always important in a book-- kids aren't going to read if it's boring (or rather, not going to want to read if it's boring) easy readers also have the educational purpose of building reading skills by having a book that may be conquered by the reader (I can do it!) that is also a bit of a challenge (so that the child can step up to the next level.). I'm a librarian, not a literacy expert. (Of course, patrons (and sometimes other people....) expect that librarian means an expert in all things.) When someone comes in asking about easy readers (or readers and any "reading level") it's a bit hard to judge. I don't know the child (and 9 times out of 10, the adult asking is solo.) I can do some reader's advisory; but no, I cannot off the top of my head say what words and sentence structure are those that are first grade or third grade. (That's why librarians are not teachers.) For easy readers, I do what parents do, and rely on the book itself. And that can be hard, because there is no universal standard for the levels found on easy readers. It varies by publishers. I've seen "low" level books that are harder than "high" level books, depending on the publishers. In the easy reader section, I have books with one or two words on a page next to Amelia Bedelia. I do the usual with parents: try to get more information than "he's six" to determine a book; explain that the levels differ by publisher; recommend taking a handful of books that the child can then select; let me know what the level was that the child liked. And while sometimes that works, other times I get the combination evil eye/ sense of bewilderment from the parent: If you don't know, how can I? I sympathize, but sadly, there are no easy answers. Take a handful of books home or bring the child in to look at the books. Which brings me back to this series; I really like that this publisher so clearly states what it means by a reading level, including grade and number of words. So the "I'm Going to READ" is not only a reading series, within the series there is an "I'm Going to..." series. The Plot: Road trip to Boston. The Good: This is similar to the NYC book, except it's set in Boston. 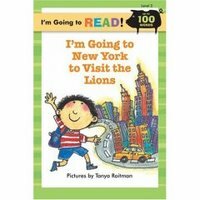 I think these are good both for kids who live in/around these areas, but also as mini travel guides for kids who will be traveling to these areas. And while some of you know my NYC love from previous posts, the Boston connection is that my grandfather's family settled there and I still have family there. While the cool reference in the NYC book is the lions, here the cool reference is Make Way for Ducklings. Interestingly, MWFD is never mentioned by name; and while that may be for copyright issues, I love that the author knows that the child reader will know the book without having to mention the title. The kid will "get it", and will also appreciate that they are expected to "get it." It's a nice, sophisticated touch. Oh, and here are the ducks that are visited. Great Booklist/ ALA Article on Easy Readers: Too Easy? Too Hard? Finding the Right Easy Reader. Links: I'm Going To Read series; Kids' Book Recommendations: Easy Readers. Edited to add: About MWFD, has anyone else heard the urban myth about Richard Nixon being included in the swan boats? I heard it first at library school, couldn't find anything to support it (I even emailed the Nixon Library, who kindly responded that they had no documentation about a link between McCloskey and Nixon. I have no idea where the copy of that email is.) This article also points out that the picture on page 7 looks like Nixon.